Melting Pot Café @ Concorde Hotel in Shah Alam serves Asian and Continental cuisine all day. 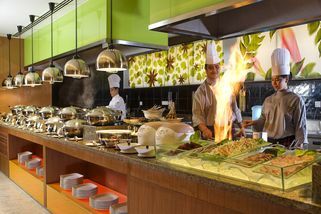 In addition to the regular buffet-style dining, they offer specially prepared dishes from chefs at their various cooking stations. "Ramadhan buffet fit for no one"
Ramadhan buffet was the worse buffet I have ever had. I booked 8 seats to treat my staff for buka puasa and it was not worth the money. Very limited selection and the food was below average.